"This is a sponsored post program with Mums the Word Network and Skylanders. All opinions are my own"
My daughter Lydia loves Skylanders! She doesn't have a huge collection but she still enjoys playing with them! They are a craze with kids right now and I love watching her play it! If you haven't heard of Skylanders, Skylanders is a "toys to life" video game series published by Activision. The portal reads the Skylanders and brings them to life on the screen! It is super cute! There are different versions of Skylanders Available! Each have their own characters and good guys and villans. My kid can tell you about it all day! I really think it is a great and fun game for kids! I don't play it with her because she is a game hog and I enjoy watching her get excited playing! Did you know that Skylander's Day is on June 27th at Gamestops across the Country? You heard that right! 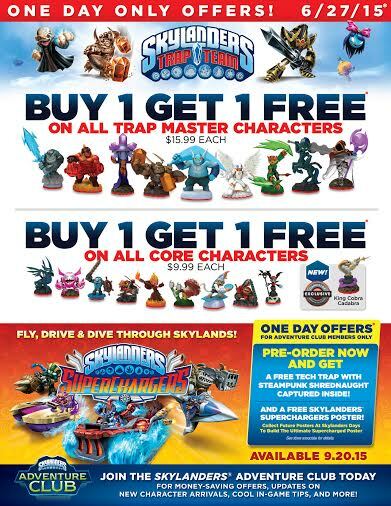 Some of the deals include: Buy one get one free on trap master figures, Buy one get one free on all core characters, and if you Pre-Preorder the newest game, Skylanders Superchargers- you can get a free poster and a free tech trap with Steampunk Shrednaught captured inside! How cool is that? Check out the flier below for more info on it! Check out more info about Skylander's Day and find a location near you! Remember, this is a one day only event! Come back here and tell me what you bought! Do your kids play with Skylanders? Tell me about it! Visit Gamestop on thier social media to stay up to date with the latest! SO many deals,So much. NOW where to start. My son does play Skylanders and loves getting new characters. I will have to check out my local Gamestop tomorrow, such good deals. I have never heard of Skylanders, though I would not be surprised if my kids have several of the toys.